Invitation: November concert "Festival Brikcius"
You are invited to the November concert "Festival Brikcius" - the chamber music concert series at the Stone Bell House (Spring & Autumn 2012) of the Czech cellist František Brikcius and brilliant Czech pianist Tomáš Víšek, held on Thursday 15th November 2012, 7.30pm, at representative concert hall from the 13th century, the Stone Bell House (GHMP, 3rd floor, Staroměstské náměstí 605/13, Praha 1, Czech Republic). Both musicians will play Sonata in D major for piano and cello by Ludwig van Beethoven (1770 - 1827), three pieces by French composer Jean Françaix (1912 - 1997), whose 100th anniversary "Centenaire Jean Francaix - 2012" we celebrate this year, Sonata for piano and cello by Swiss composer Arthur Honegger (1892 - 1955) will remind his 120th anniversary and brand new composition Illusions, by Czech composer and organist Irena Kosíková, who is living in France, commissioned specially for "Festival Brikcius". Next concert "Festival Brikcius" (siblings cello Duo Brikcius) will be held on Thursday 20th December 2012. Tickets are exclusively available through official festival ticket sales Prague Ticket Office - Via Musica (http://www.PragueTicketOffice.com - Via Musica, AMU, Malostranské náměstí 14, Praha 1 - Via Musica, Staroměstské náměstí 14, Praha 1 - Tel. : +420 224 826 440) and cca 90 minutes before every concert at the door. Due to the limited number of seats we strongly recommend early booking. Full entry fee: 40O CZK (advance ticket sales 380 CZK) / student and senior over 65 years: 200 CZK (advance ticket sales 180 CZK) / maecenas - sponsorship fee: 4 000 CZK (advance ticket sales 5 000 CZK). Support "Festival Brikcius" and buy maecenas ticket here (honorary seat reservation, 2nd ticket for free + 1CD gratis). In cooperation with the Gallery of the City of Prague and Daniel Pearl World Music Days. "Festival Brikcius" reminds the 220th anniversary of the birth of the Italian composer Gioacchino Rossini, the 120th anniversary of the birth of the Swiss composer Arthur Honegger and the 100th anniversary of the birth of the French composer Jean Françaix "Centenaire Jean Francaix - 2012". Further details on websites http://www.Brikcius.com , http://www.PragueTicketOffice.com , http://www.GHMP.cz , http://www.JeanFrancaix-Centenaire2012.org , http://www.iKosik.com , http://www.FaceBook.com/FestivalBrikcius , http://www.FaceBook.com/Brikcius.Frantisek (FaceBook event here) & http://www.Twitter.com/Brikcius . Thursday 15th November 2012, 7:30pm, The Stone Bell House (GHMP, 3rd floor, Staroměstské náměstí 605/13, Praha 1, Czech Republic). Competition: Win 1 x T-shirt "Brikciusová Na Prádle - My zemí nejdeme" and 1 x 2 free tickets for the Christmas concert "Festival Brikcius"
Where is held poetry reading "Brikciusová Na Prádle - My zemí nejdeme"? Contest is over, lucky winners are P. T. from Teplice and S. V. from Prague. "Centenaire Jean Francaix - 2012" - 100th anniversary of the birth of the French composer Jean Françaix is celebrated by many musicians all around the world. More than 650 concerts and events were already listed in more than 35 countries. "Centenaire Jean Francaix - 2012" is co-organiser of project "Festival Brikcius". For more details about "Centenaire Jean Francaix - 2012" visit websites http://www.JeanFrancaix-Centenaire2012.org , http://www.JeanFrancaix.org and http://www.FaceBook.com. "I wish to be honest: when I am composing, the finest theories are the last things that come to mind. French composer and pianist Jean René Désiré Françaix was born on 23 May, 1912 in Le Mans - France into a musical family. His natural gifts were encouraged from an early age by his family: his father Alfred, a composer, pianist, musicologist and director of the Le Mans Conservatoire, and his mother Jeanne, a singer and the founder of a renowned choir. In 1922 at the age of only 10, the young composer wrote his first composition, a piano suite entitled "Pour Jacqueline", dedicated to a cousin, which was two years later printed by the publishing house Editions Sénart. He studied at the Conservatoire of Le Mans and encouraged by composer Maurice Ravel (1875 - 1937), he continued his studies at the Paris Conservatoire, composition with composer and conductor Nadia Boulanger (1887 - 1979) and in the piano class of composer and pianist Isidore Philipp (1863 - 1958). In 1930 he received the Premier Prix in Piano at the Paris Conservatoire. Early success came in 1932, with a performance of his Huit Bagatelles for piano and string quartet at the ISCM Festival in Vienna and in 1936 with the first performance of his Concertino for piano and orchestra at the chamber music festival in Baden-Baden. Despite close contacts with Francis Poulenc and the "Groupe des Six", Jean Françaix never felt committed to any particular musical ideology. "Groupe des Six" was a group of six French composers, Georges Auric (1899 - 1983), Louis Durey (1888 - 1979), Arthur Honegger (1892 - 1955), Darius Milhaud (1892 - 1974), Francis Poulenc (1899 - 1963) and Germaine Tailleferre (1892 - 1983). During the ensuing years, the composer extended his oeuvre with numerous works in a wide range of genres including operas, ballets, orchestral works and also solo concertos, film music and vocal works. The composer also focused intensively on chamber music. 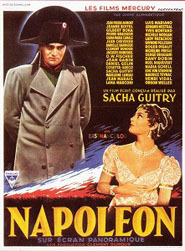 His distinguished film scores include the collaborations with director, actor, screenwriter and playwright Alexandre-Pierre Georges "Sacha" Guitry (1885 - 1957) on films Si Versailles m’était conté (1953), Si Paris nous était conté (1955) and Napoléon (1955). 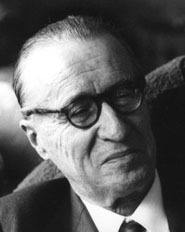 Françaix taught at the Ecole Normale de Musique in Paris from 1959 to 1962. He participated actively in concert life, often played his own works in Berlin, London, New York and Boston. He performed notably in a duo with the French cellist Maurice Gendron, (1920 - 1990), the Trio Pasquier and frequently together with his daughter Claude as partner at the piano. He also performed the Poulenc Two Piano Concerto with Francis Poulenc (1989 - 1963). Jean Françaix died on 25 September 1997 in Paris. Jean Françaix received numerous awards, the Florence Gould prize (1950), the Prix du Portique (1950), the Grand Prix du Disque within the area of chamber music (1954), the Grand Prix du Disque as performer and composer (1965), the Grand Prix de la Société des auteurs dramatiques (1983), the Grand Prix Arthur Honegger (1992) and the Grand Prix SACEM de la musique symphonique (1992). In addition, Françaix was awarded the title of Officier de la Légion d'Honneur (1991), Commandeur de l'Ordre du mérite culturel by the royal house of Monaco (1993) and the Commandeur dans l'Ordre des Arts et des Lettres (1994). He is one of the most frequently performed French composers of the 20th century, particularly outside France. 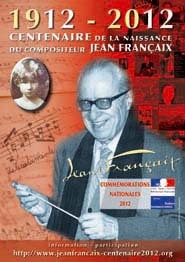 In 2012 we celebrate 100th anniversary of the birth of the French composer Jean Françaix "Centenaire Jean Francaix - 2012". You are invited to poetry reading "Brikciusová Na Prádle - My zemí nejdeme", from the poetry by Anna Brikciusová in the interpretation of Jan Židlický and music accompaniment of cellist Anna Brikciusová, held on Wednesday 16th November 2012, 6pm, at the Church of St. Jan Křtitel Na Prádle (Říční 6, Praha 1, Czech Republic), as part of the 14th Poetry Day Festival. Free entry. Event will feature premiere of composition "Danse funèbre pour violoncelle seul" (2012) by Czech composer and organist Irena Kosíková. 14th year of the annual Poetry Day Festival is held around the anniversary of the great Czech Romantic poet Karel Hynek Mácha (*16th November 1810). This year’s festival has the title "Pře-stup". In the cooperation with the Poetry Day Festival, the Church of St. Jan Křtitel Na Prádle, festival "Daniel Pearl World Music Days" and supported by printing company Tiskap. For more details visit websites http://www.Brikcius.com , http://www.DenPoezie.cz , http://www.Husiti.Majestat.cz and http://www.FaceBook.com/Brikciusova (FaceBook event here).